Viacom controlling shareholder Sumner Redstone and his protege Philippe Dauman are engaged in an epic battle of control for the media company. Dauman, the CEO of Viacom, says Redstone's daughter Shari is pulling the strings of her sick father, taking steps that are against his wishes. Shari denies that. And no one knows what will happen next. The fight revolves around the trust that will control Viacom and Redstone's other business, CBS, after he dies. On Friday night, lawyers for Sumner Redstone said he had decided to remove Dauman and fellow Viacom board member George Abrams as trustees. The lawyers also said Dauman and Abrams had been ousted as directors of National Amusements, the holding company for Redstone's majority stakes in Viacom and CBS. Their removal was first reported by Fortune. A Viacom spokesman, speaking for Dauman, said the moves were "invalid and illegal." Redstone is "being manipulated and used by his daughter" Shari, the spokesman said. Redstone's health is so frail that he has great difficulty speaking. Amid deepening concerns among investors, Redstone has gradually loosened his control of Viacom and CBS, most recently by giving up his chairman titles at both companies. 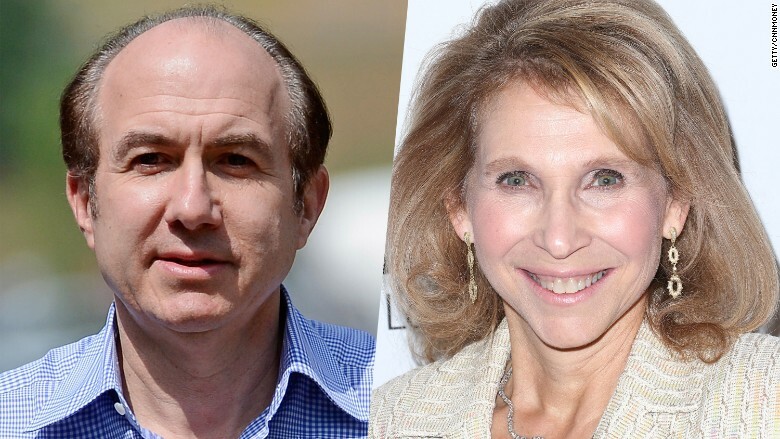 Dauman succeeded Redstone as chairman of Viacom in February -- but Shari Redstone voted against him. The Redstone family relationship is the stuff of media industry legend. Sumner and Shari were once estranged but are now quite close. Earlier this year, Shari replaced Dauman as Sumner's health care agent. Sumner and Dauman were exceedingly close -- their bond was often depicted as that of a father and son as well as mentor-mentee -- but the relationship has been strained amid this corporate power struggle. On Friday night, Dauman accused Shari of trying to "accomplish her long-held goal" of taking over control of the company, contrary to her father's wishes. He also questioned his longtime friend's mental capacity. The lawyer acting on Redstone's behalf, Michael Tu, responded by explaining that Redstone's "lawful action" was executed in the best interest of both stockholders and Viacom. "The public statement made on Mr. Dauman's behalf attacking Mr. Redstone's capacity is disappointing and incorrect, as reflected by Mr. Dauman's own testimony given under oath less than six months ago that Mr. Redstone is as 'engaged, attentive and as opinionated as ever,'" Tu said. "That is exactly the Sumner Redstone who made these decisions today." There is little evidence that the elder Redstone is engaged or attentive. He has stopped speaking on quarterly earnings calls. During a recent deposition, some of his answers to questions sounded like grunts and moans. Viacom said in a new statement on Saturday, "There has been no communication from Sumner Redstone. In fact, during an in-depth strategy session of Viacom's Board Tuesday evening and all day Wednesday, not a sound was heard from Sumner, who was connected by phone. Shari Redstone, also connected by phone, did not raise a single concern during the Board session on any topic." That's noteworthy because the board voted on Wednesday to stop paying Redstone's salary. His compensation had already been cut in December -- no more bonuses or stock in the company. At the time, Viacom said he would still get his $2 million salary. The recent actions are reflective of increasing concern on the board level about Redstone's condition and the impacts on the company. The bottom line according to Viacom's statement on Saturday: "The actions taken yesterday in Sumner Redstone's name are completely inconsistent with his long-expressed wishes and intent and extremely disruptive and damaging to Viacom and all its shareholders." The statement accused Shari of isolating Sumner and putting "his residence on lockdown." It said that members of Viacom's board have been "denied access" to him. A spokeswoman for Shari responded simply, "l fully support my father's decisions and respect his authority to make them." Redstone was also recently in the midst of a legal battle to determine whether he was mentally competent. A judge eventually threw out the case, but not before Redstone was forced to give a deposition on-camera that was practically incoherent. The case was brought against Redstone by his former girlfriend Manuela Herzer. She was challenging Redstone's decision to evict her from his home in Los Angeles and take away her right to make health care decisions for him. At that time, last fall, Dauman replaced Herzer as his health care agent.